When you have an attic room you don’t have a proper regular flat ceiling. And when it comes to deciding what lamp to install and where, you’re often confronted with a lot of options and an equal amount of doubts. If you renovate you have to take the decision early enough to let your electrician put the cables in the right places. This means that you often have to decide when you still don’t know how the final result will look like. There are several options depending on the kind of light you want to have, on the volume of the attic room(s) and their use, on the available heights and of course on the style you like. – if your attic is one big volume with no partition walls and a high slanted ceiling, you can choose to hang one or more big pendant lights from the top beam. Remember that the size of the lights has to be in proportion with the volume of the space otherwise the lamps will feel lost in the void. 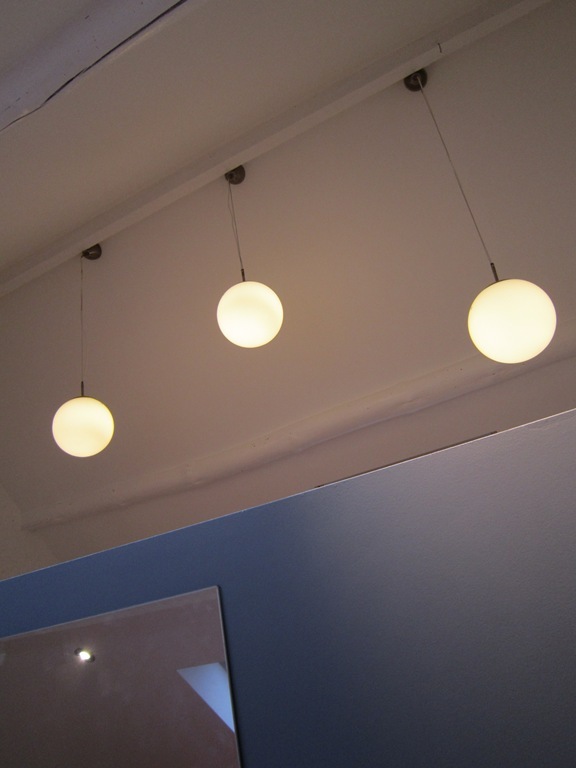 You can put one big pendant light or several smaller ones one next to the other at different heights. This will give a diffuse ambient lighting and emphasize the space. Another alternative can be putting a cable-system that runs from one vertical wall to the other. – if your attic is one volume but you don’t have much height, you have to be careful that lamps are not in the way. Avoid cable-systems and pendant lights and opt for wall lights on the vertical walls. If you don’t have vertical walls you can use a floor lamp and connect it directly with a switch. – if your attic is divided in several rooms, each with a portion of slanted roof you can choose according to the type of light you want. 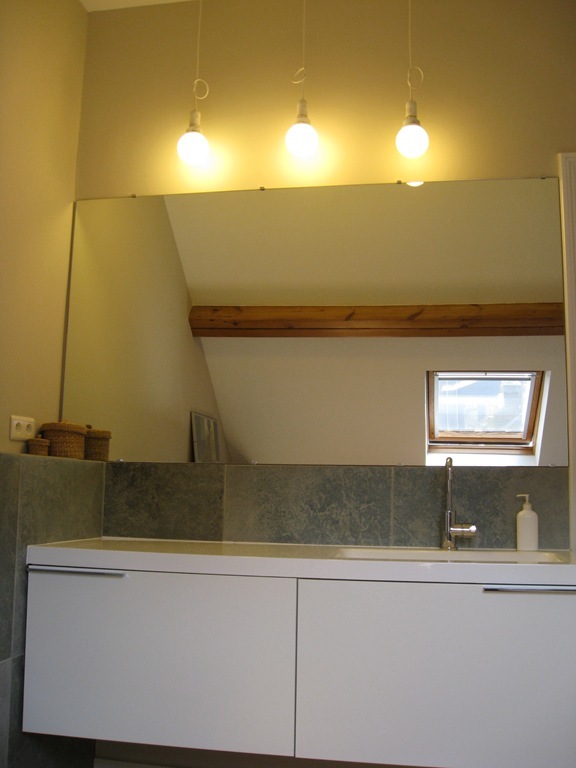 For example you can have hanging lights over a sink to bring direct and stronger light where needed. Here below a simple solution, with big bulbs hanging from the top. 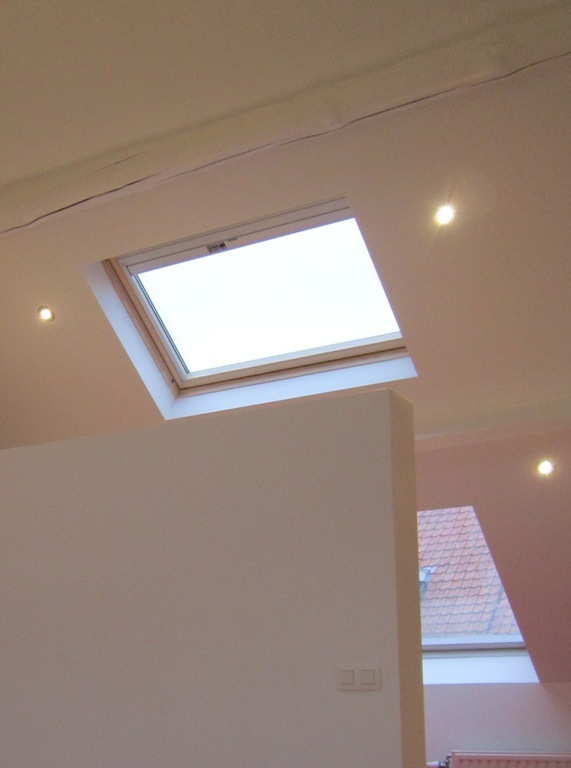 Or you can have recessed lights within the slanted roof to have a more diffused and uniform light. 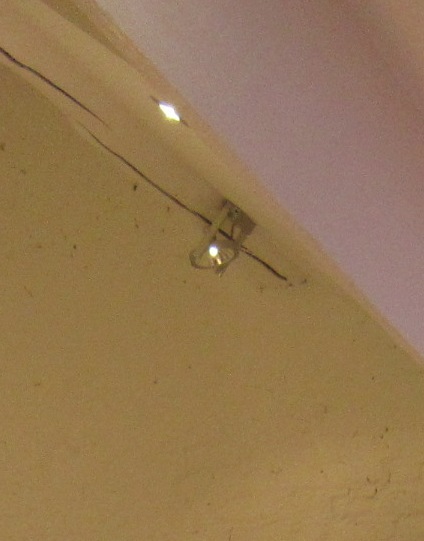 Or spots attached directly to the beams for a more theatrical effect. 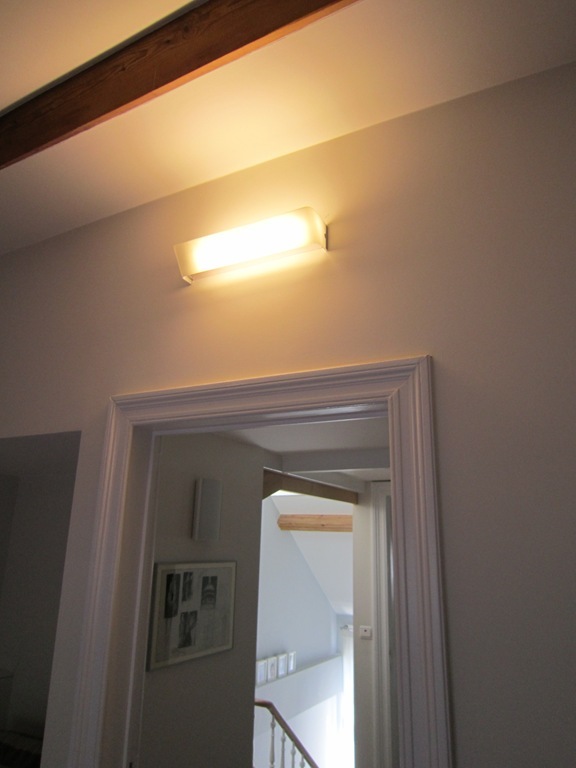 Another option is to leave the slanted roof as it is and place one or more wall-lamps on the vertical walls. If you don’t know what to choose, you can combine several lamps together. Rob, a former client of mine who has a passion for lights just put them all: pendant lights, recessed lights, spots on beams and two different kind of wall lights. He can obtain all the lighting effect he wants (I particularly like a wall light on a brick wall which highlights the wall texture) and … he gave me the perfect portfolio to display!